Creating line art - swooshes - using Parametric Curves. Want to make "Line Art" like this one? Comments are welcome in order to improve the guide and my "style". Got more examples if anyone wants them. Last edited by ragstian on Wed Oct 24, 2012 12:37 am, edited 4 times in total. Re: Creating line art - swooshes - using Parametric Curves. are you kidding?!!! Of course we want more examples! Don't hold back! The tutorial is great, i'm sure it will inspire people to have a go at the parametric curves extension. Have you seen this guy's site? Druban - great site in the link. 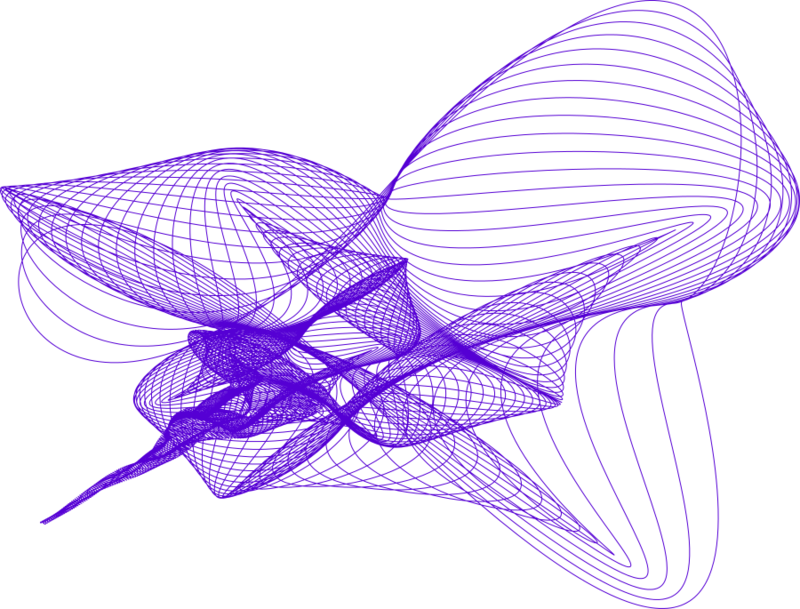 Got the equations for the butterfly curve and also for the harmonograph - will try to get something similar Inkscape. Well, I'd love to see what you're talking about, but I'm getting a blank page at Dropbox. brynn: Don't know why you can't see the content of the file from Dropbox - works fine on my machines - PC and Mac. Might be an idea to update your Acrobat reader to latest version? Last edited by ragstian on Tue Feb 17, 2015 12:40 am, edited 6 times in total. I do have the current version. I finally realized that I have to click Download to see the PDF. For some reason, when I try to see an image hosted at Dropbox, the page is often blank. For PDFs, I can click Download, and get it to open. But I haven't solved the problem for PNGs yet. Also, I'm not sure why I thought Parametric curves would be available in a future version. It's there now, and I can't wait to try it! Figured out the PDF file link problem. Dropbox gives you a link with www in the address - the www has to be changed to dl - in addition to "force" download I have to append ?dl=1 to the end of the link. Using this scheme I can get the images to load using the [img]--[/img] tag but they load at full resolution, no thumbnail preview - trying to find solution. Got the tumbnails to work - finally! Guide in links above are latest version. Stay tuned as updates are likely!